Open Arms’ Outreach Doula program connects expectant and new parents to outreach doulas who are from their community and who are specially trained to provide support during the sensitive first months of pregnancy through a child’s second birthday. This long-term support provides firm links within a community and extends the support of a doula from the time that a person learns of the pregnancy through the years when babies and families grow and change the most. This program is community-based support at its strongest: linking doulas who are from the same community as their clients and who are able to bridge cultural and language barriers to meet health needs. Our outreach doulas are creative in supporting clients according to their individual needs and the needs of the community. They serve many roles for the families with whom they work – not only in support of pregnancy, birth, and postpartum, but also in the role of cultural navigator, “walking alongside” pregnant and parenting families to help them navigate and access resources for their children so that they can support their children’s early learning, right from the beginning of life. 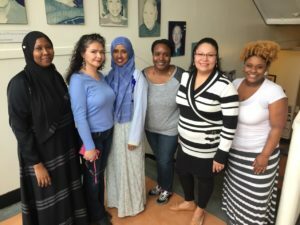 Currently the Outreach Doula program serves the African American, Latina, Native (American Indian/Alaska Native), and Somali communities. The Outreach Doula program is nationally accredited through HealthConnect One and was the first community doula program in the nation to achieve accreditation. National accreditation validates our community-centered approach to providing services to families and affirms the excellence and quality of our program.